In the early years of automobiles, travelers relished a newfound freedom. No longer confined to destinations limited by iron rails or a navigable river, they took off across a country laced with roads. As they journeyed, they would stop in towns along the way to spend the night. Although it didn’t take long for the first motels to develop, many travelers would look for campsites. Towns along the way accommodated this new need. In small towns, motorists were often permitted to set up their tents in the town square. But Rock Island was a bit more sophisticated. In the mid 1920s, the Park Board established a municipal tourist camp on eight semirural acres near the Rock River at 46th Avenue. 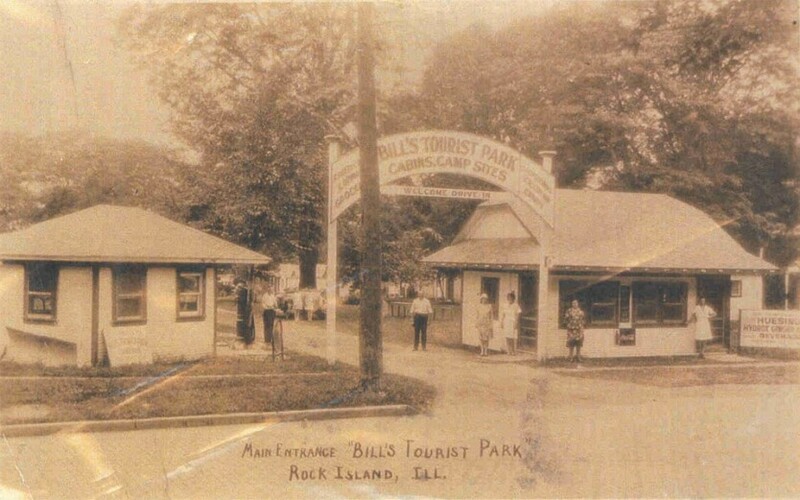 This circa 1930 postcard shows the Rock Island Municipal Tourist Camp soon after it became the privately owned Bill’s Tourist Park. Thanks to Shannon Hall for sharing the postcard. Descriptions of the municipal facility in 1924 noted the presence of toilets, benches, and a Dutch oven. We’re not quite sure what a Dutch oven was or how a single one could accommodate the needs of many campers. There was also a pavilion that originally had been built as the town hall of Sears. Sears town was annexed to the city of Rock Island in 1915. The camp was open from mid April through October at a charge of fifty cents per night per auto, for a maximum stay of six days. Rock Island residents could camp for free. Tents were to be pitched where caretakers Mr. and Mrs. Andrew Etzel directed. Other regulations prohibited specific campground activities including basket weaving and scissors grinding. The same regulations stated that auto repair and clothes washing were permitted. From our modern perspective, this seems curious. It may have been that the first two activities were associated with transient or “gypsy” workers, while the latter two were crucial for the average traveler. Nonetheless, the fairness of this discrimination seems questionable to modern observers. In 1924, it was reported that 1500 people from 24 states, traveling in 500 cars, used the facility. The following year, showers that drained to a nearby ravine were added to a shelter on the north side of the camp and a faucet was added to the Dutch oven. By 1927, plans were being made to build six cottages for the convenience of travelers. In the late 1920s, there was a movement to disband the Park Board. This may have been one of the factors that caused the board to divest themselves of the municipal camp. By 1930 the site was owned by William and Daisy Hendrick, who renamed it Bill’s Tourist Camp. This is when our “real photo” postcard was published. The street in the foreground appears to be 9th Street and this main entrance was near 46th Avenue. The signage is evocative of the 1930s as well. The arched gateway notes the availability of both camp sites and cabins, while the sidebars indicate that cold drinks, candy, ice cream, lunch, fried chicken, and groceries can be purchased. At the far right, locally bottled Huesing’s Hydrox Ginger Ale rates a larger sign than does Coca-Cola. The background of trees gives an indication of the pastoral nature of the original site, which slopes gently toward the Rock River and even has a small creek near its northern boundary. There’s no evidence of the two buildings in the foreground today, but in 2002 the small building on the left looked much as it did on the postcard. That address would today be 47th Avenue, just west of 11th Street. The facility was called a Tourist Camp into the 1940s. By the 1950s, as travel habits and facilities relied less on tents and more homes on wheels plied the highways, the name was changed to Bill’s Trailer Park. A later name change made it Michael’s Trailer Park. And even as the small camping trailers grew to large not-so-mobile homes, a final renaming in the 1970s resulted in Michael’s Mobile Home Park. In 2006 the old tourist park was closed and the mobile homes were moved out, pending a future undisclosed use. This article by Diane Oestreich, slightly modified, originally appeared in the Moline Dispatch and Rock Island Argus on December 1, 2002.